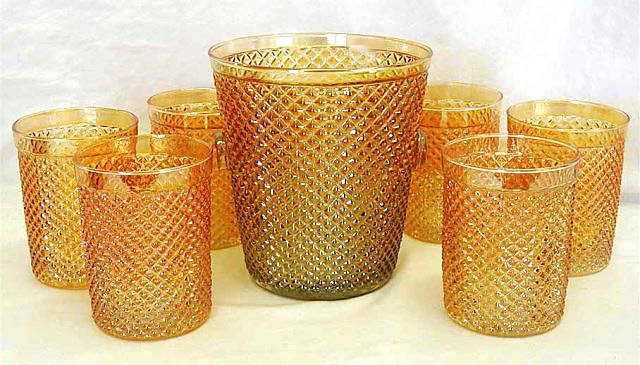 A scarce pattern, these baskets bring a good price if iridized. Many examples are damaged, so be sure you check any that you consider buying carefully. Prices listed are for examples in perfect condition. 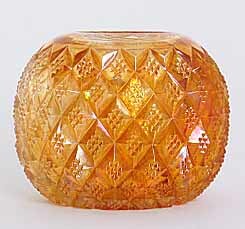 Note that Northwood made vases that are called Diamond Point, but are quite a different pattern. 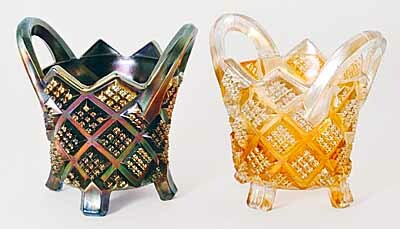 On the right is a rosebowl in a similar pattern that was identified as Diamond Point at the 2003 auction where it brought $675. Another of these, or perhaps the same one, sold in 2016 for $150. Unlikely this item has anything to do with the Northwood pattern. When this marigold set sold in 2016 for $60, it was described as a Diamond Point Ice Set. Obviously not the traditional Diamond Point pattern. I suspect it's from the depression era. Photo courtesy Seeck Auctions.